increasing the cultural-historical awareness of the residents of ‘s-Hertogenbosch and of the visitors to our city. Partly due to the broadly oriented objectives of our association, we have a considerable number of members. Nowadays, our association comprises more than 2,300 members who fully support the cultural history of our beautiful city. Quite a few of these members, around 380, regularly work as volunteers. Practically each day our volunteers share their love for the city with you in a hospitable, cordial and fascinating way. 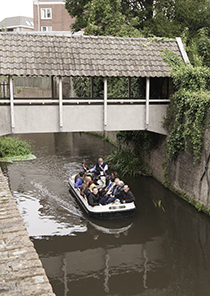 They provide guided tours, walks and boat trips and ensure that your day out in ‘s-Hertogenbosch becomes a nice, lasting memory.